NEW. Exclusive Oilfield Camo® design for the drilling industry. Pipe tally books with your logo. Minimum quantity with your imprint, 50. Quantity variation +/- 5% is possible and billable. See all of our NEW gas & oil Pipe Tally Books. Exclusive Oilfield Camo® design, created for the oil industry! Made in the USA. Matches the Oilfield Coaster 4912. Tally books are essential tools in the oil and gas industries. Customers who need od diameter tapes also need pipe tally books. 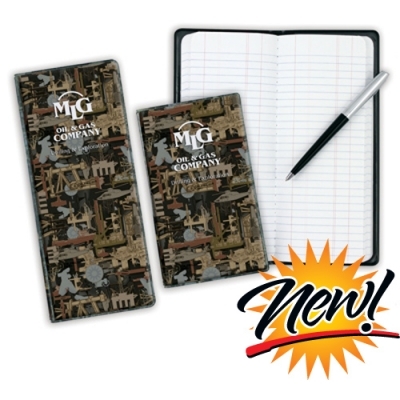 This hard bound book is durable for daily use in the field. They can also be used in any other application that requires continual record-keeping. Price includes sewn pad, vinyl cover, with your imprint on front, or both sides, in color. Imprint size: Both front and back. Options: Clear Pen loop sealed into tally book for convenient insertion of pen. Located part way down, inside front cover, or other locations per your request. Option: Inside cover, front and back, 1-color imprint. We can print decimal equivalents, or anything you supply us, like pipe size table, fittings table, etc. $0.35 each book, plus setup. The inside pockets are clear vinyl. We recommend a black imprint as it shoes up the best. You get both pockets imprinted, as long as the imprint color is the same. Optional Insert: Securely inserts into front or back cover and has three clear view insert pockets. Great for contact numbers, charts, and more. Ask for price.